Hair transplantation has changed dramatically over the past decade. What used to be complex surgery is basically now a day or half day event in a chair. About four years ago my practice merged with the Washington medical hair clinics. It’s been a wonderful marriage. All of the physicians involved in your care are Board Certified plastic surgeons. Today hair isn’t placed in lumps or clumps. Hair can be harvested in three different ways which are discussed below. Hair is taken from areas of the scalp that are not prone to hair loss and placed in areas that are lost or thinning. For appropriate candidates the surgery can help both men and women. The individual hairs called microfollicular grafts are individually planted into the scalp giving the most natural hairline possible. Local anesthetic is used and patients spend the day with us listening to music or watching movies as the procedure is performed. 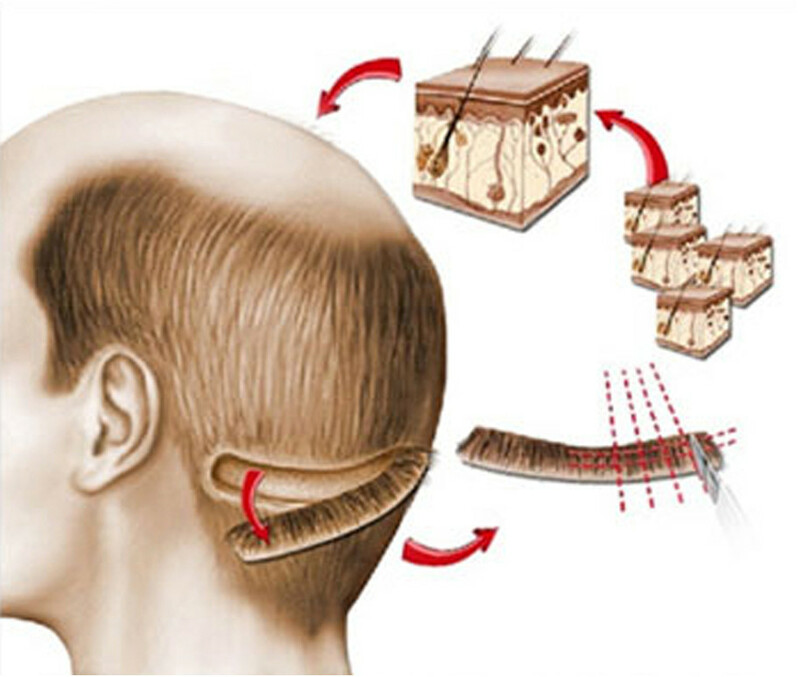 1) Strip graft: In Strip graft a strip of hair bearing skin is removed from the back of the scalp. It is performed under a local anesthesia. The benefit of a strip graft is that it gives the highest yield of transplantable hair, so it is a good choice for patients looking to restore a larger area and there is no shaving of the back of the head. The down side is that it leaves a scar in the back if the head so it’s not a great option for patients who wear their hair very short. In patients with longer hair the scar can be hard to find. Neograft (see below) scares people with pictures of ugly scars. Generally, as a plastic surgeon our scars are well hidden and accepted. Many hair transplant surgeons are not plastic surgeons, in fact some are not surgeons at all. 2) Automated follicular unit extraction : Automated follicular unit harvests one hair or small groups with a small coring needle (called “follicular unit extraction”). This too is done under a local anesthesia. It is not “scar less”, but it leave small holes in the back of the head where the hair follicle was removed. These small holes heal in almost imperceptibly. The benefit is that its less invasive and recovery is a little more comfortable than a strip. The down side is that it can take longer and give less yield. It also requires that the head be shaved in the donor site and it will take some time for the hair to grow back. Large areas may require multiple sessions. It may not be a good option for patients with curly hair as there can be a higher rate of hair root injury. 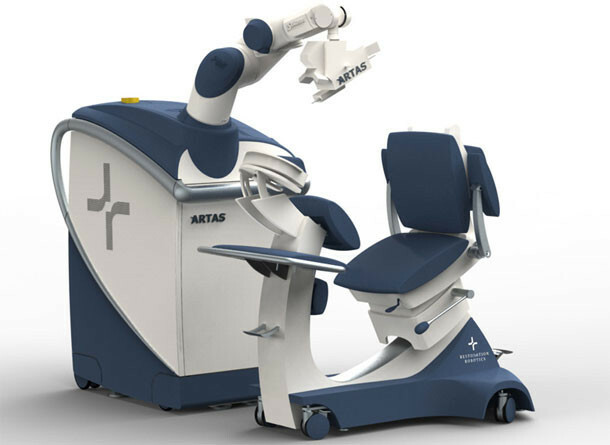 3) ARTAS Robot: The ARTAS Robot is the newest kid on the block. It is basically the same idea as the follicular unit extraction, with the same pro’s and cons, but harvesting with the robot is automated. This makes it faster, and it can do more in a day. Same idea as automated follicular unit extraction, different tool, but faster, more precise and unfortunately more expensive. All of them. It really depends on the patients needs and goals. It’s good to have different options because each patient is different. Some don’t want the head shaved so a strip is more appealing, some have smaller areas to restore so automated follicular unit extraction or the Artas Robot is more appealing. 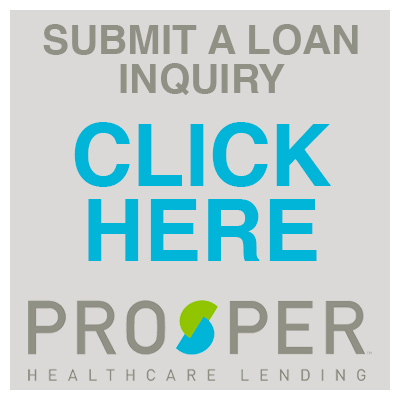 The ability to offer each technique allows us to treat a broader range of patients. Patients are sent home with a regimen of pain medications and an antibiotic. Postoperative pain usually last only about a day even with a strip graft. The there are scabs on the recipient and donor site that take about a week to fall off. Full activity can be resumed in about a week. For strip graft external sutures are removed 10 days after transplant. You will need to be evaluated to be sure hair transplantation is right for you. It depends on the pattern of baldness. There is no sense in transplanting hair from an area that is programmed to loose it. Can I restore a full head of hair? All hair transplant is an example of robbing Peter to pay Paul. The denser the hair in the back of the scalp the more you can use elsewhere, but the recipient site will not be as dense as original native hair before hair loss. Young men in the early stages of hair loss are what I call moving targets. If they are appropriate candidates they can be transplanted, but their native existing hair loss may continue for some time. In fact, the transplanted hair is more likely to remain than the native hair. Patients who are moving targets must simply consider further treatment in the future as their hairline continues to change. Can other areas be transplanted? Yes, We have successfully transplanted hair for eyebrows, beards, moustaches and sideburns. Sometimes even old scars will accept hair transplants and can be camouflaged. Of course there are wigs or weaves. 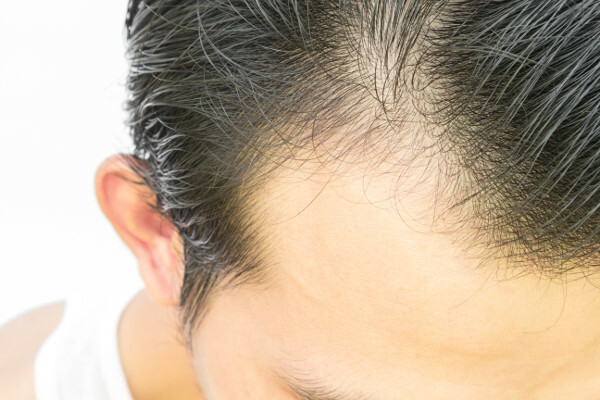 Propecia and Topical Rogaine have some evidence of hair maintenance or restoration, but results are varied and unpredictable. There is some evidence that laser light stimulation may be beneficial as well. We offer these options to our patients who are not ready for surgery. Cloned hair is on the distant horizon but does not exist yet (and is still a minor surgery). Some inject the scalp with growth factors, but there is no controlled scientific evidence that it really works.